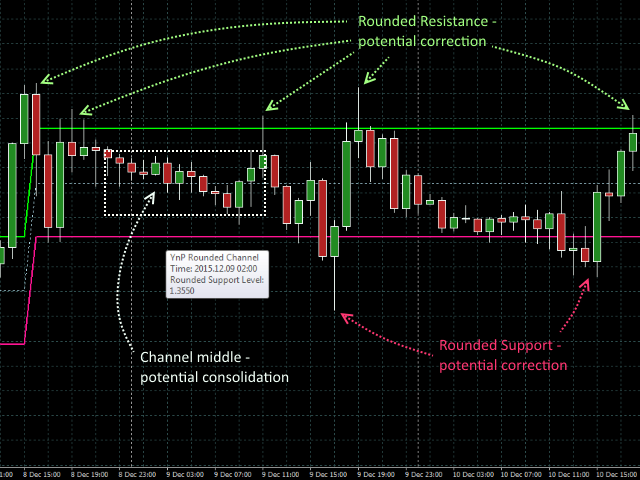 The indicator shows the channel of rounded support and resistance levels in which the price moves. In contrast to "historical" indicators showing the already occurred events, this tool shows the levels, where the main market competition takes place and a price reversal is more likely. The rounded levels also help to predict the key points where the price peaks had not been formed before. 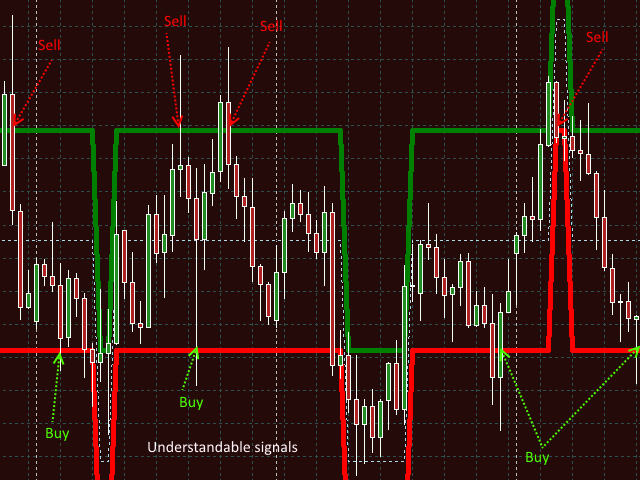 The indicator allows to specify the take profits and stop losses, to see the price reversals on the rounded levels. 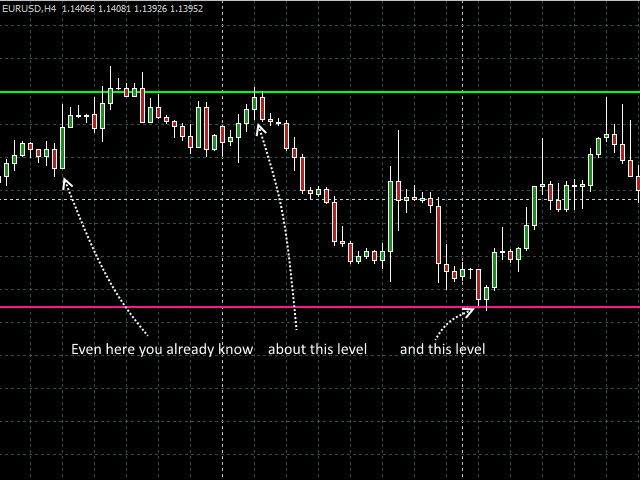 Indicator is very useful for trading strategies based on "false breakouts" or "reversals" from the key levels. This version is designed for the MetaTrader 4. The version for MetaTrader 5 can be found here. 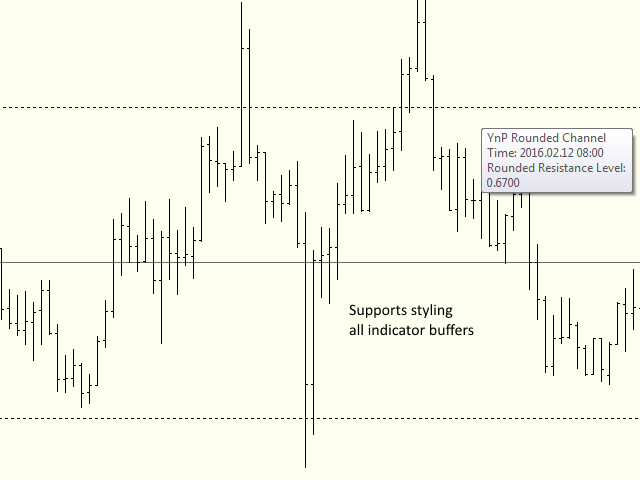 This indicator belongs to the YnP series of high-quality software products. Channel Width - channel width. The number of points between the support and resistance levels of the channel. The width should be specified according to the average daily volatility of the instrument. At the same time, the volatility of the instrument (i.e. the number of points from High to Low of the daily bar) must be greater than the channel width (for example, volatility - 73 points, width - 50 points). The recommended value for most currencies - 50 or 100 points (three-digit and five-digit points are considered as 0.1 point of width). The value must be round (evenly divisible by 50). Channel Smooth - channel smoothing. The period in history bars used to calculate the current channel. At the higher values of smoothing the "false breakouts" of channel become clearer. Also, at the high values the smoothing is more readable. At the lower values the channel reacts to the "exit" from the current channel faster. The recommended values - from 3 to 8 bars. Added alerts on the price leaving the channel boundaries (the alert reports that the price is outside the channel once every bar).